Charlie Sloan, Nianjema school manager, with active primary students. Since the founding in 2000, Nianjema has grown to almost 500 students. It offers nursery, primary, secondary schools, and provides hostels and board options. Individual donors through The Tanzania Education Fund are critical partners, providing annual funding for scholarships, books and supplies, science lab equipment, teachers and ongoing developmental needs of Nianjema. USAID has been an important partner in this growth, providing grants for much of the capital development. Nianjema means “Good Intentions” in Kiswahili. The school lives up to its name. Since its founding in 2000 Nianjema Secondary School has brought educational opportunity to hundreds of Tanzanian children. The school is built on a foundation of friendship, hard work and vision. 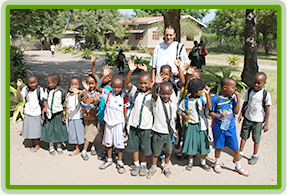 As a Peace Corps volunteer in Tanzania, Charlie (Charles W) Sloan, Jr., saw many children who could not afford to go on to secondary school after leaving the government-run elementary schools. He dreamed of providing a quality, affordable education for children in Bagamoyo and neighboring communities. Charlie invested his life savings to found Nianjema, working with three Tanzanians friends: Dr. Frank Manase (one of his former students), Daniel Manase, an architect/builder, and Gideon Kiyenze, a government official. Charlie is now the school manager, Dan was the initial architect and builder and Gideon and Frank continue active roles as school Trustees. Faustine Rutaihwa, Dr. Aidan Njau, Lazarus Mpondo and Nicholas Walter have since joined the Trustees. Rutaihwa consults on human resources, Dr. Aidan on student health and the new clinic, Mpondo on teaching techniques and Walter on business and operations. This partnership is important because it realizes a core part of Charlie’s dream—that the school have local identity and ownership. Charlie himself has settled in Bagamoyo with his wife, Mastidia, who is a local doctor, and their three children. The school draws students from throughout the area, many of whom simply appear at the front door in their best clothes asking to be taught. At the beginning, some students walked more than 4 hours a day to get to and from the school. Nianjema responded by developing hostels (or dormitories) for it students—starting with a place for girls to stay within the school compound. Nianjema has also inspired families to construct homes nearby for their children’s benefit, contributing dramatically to developing the area economy.